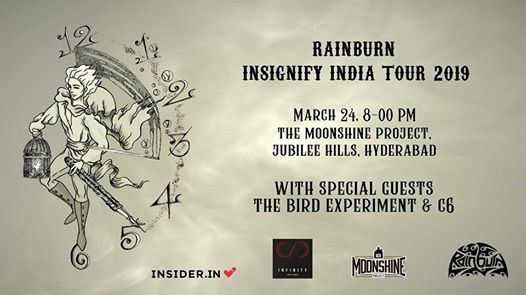 The Hyderabad leg of the Rainburn (Bangalore) India Tour also featuring The Bird Experiment and C6. 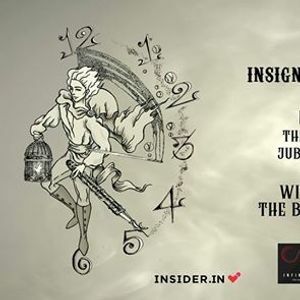 Rainburn are a heavy progressive rock band based in Bangalore, creating emotionally compelling music that is equal parts modern and classic. The band's debut EP, Canvas of Silence, was picked by Classic Rock Magazine as one of the Top 5 Prog Albums of 2015. Rainburn toured India in late 2016 as part of the hugely successful Progworks on Wheels series, and in early 2017, the band was featured in the pages of Prog Magazine in the coveted 'Limelight' section. Insignify, Rainburn's debut full-length album, was released on November 7, 2018 to widespread critical acclaim. Insignify was a featured album on Apple Music and was named among the Top 10 Indian Albums of 2018 by Rolling Stone magazine. "Recognize the heartbroken blues in the metaphorical lyrics to the naughtiness of a mid-twenty something in the love for the shenanigans." C6 is an all instrumental project from Hyderabad. With influences from Iron Maiden all the way to Dream Theater, C6 is upbeat with fast riffs and breakdowns to add extra groove to the act. A lot of melodic patterns that will surely amp up your day.